For some, the month of November stirs up memories of turkey, stuffing, cranberries, pumpkin pie … and warmer temperatures than those we're currently enjoying. (We're not bitter. Just bitterly cold). For Karen Crowley of Kansas City, the 11th month will always make her think of Mayo Clinic. That's because six Novembers ago, Crowley and her family spent three weeks in Rochester while she underwent a stem-cell collection procedure as part of her treatment for what she calls "smoldering myeloma." 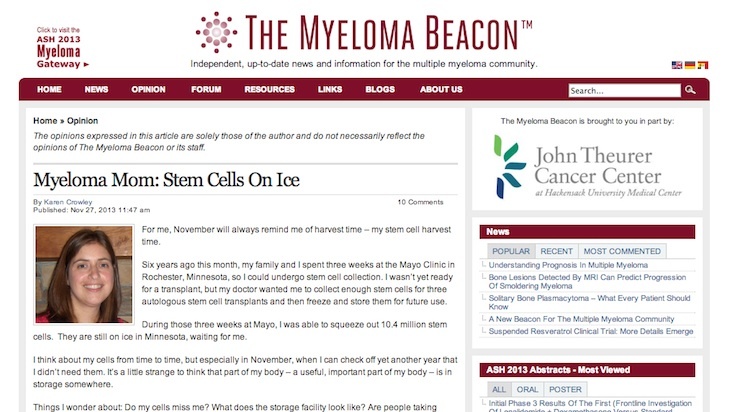 In the Myeloma Beacon, to which she's a regular contributor, Crowley writes that while she wasn't ready for a stem cell transplant when she first came to Mayo, her doctor did encourage her to have "enough stem cells for three autologous stem cell transplants collected and frozen for future use" in case that time did come. Crowley writes that during her three weeks at Mayo, she was "able to squeeze out 10.4 million stem cells" that are, to this day, "still on ice in Minnesota, waiting for me." She also says that she thinks about those stem cells every now and again -- especially when the calendar turns to November and she can "check off yet another year" of not needing them. "It’s a little strange to think that part of my body -- a useful, important part of my body -- is in storage somewhere," she writes. And she goes on to wonder, "Do my cells miss me? What does the storage facility look like? Are people taking good care of them?" And perhaps most important of all, "If I need to have a transplant when I’m, say, 42, will using cells harvested when I was 32 make me feel 10 years younger?" While we can't answer that one, we do know that Crowley does a nice job of very candidly sharing her Mayo Clinic story, beginning with a detailed account of her stem cell collection procedure (during which she says her "sweet nurses" at Mayo brought her pumpkin pie while she watched the Macy's Thanksgiving Day Parade on TV) and ending with her struggles to cope with the restrictions and limitations that it put on her most important job of all: Being a mom. "But I got it all done," she writes, "and I know I shouldn’t complain about any of this stuff. I was lucky to get all of these cells. I have been lucky to not need them so far. I know all of this is part of the drill for myeloma patients, and I made it through." You can read the rest of Crowley's Mayo Clinic story here. Then, be sure to share your comments on the below and use one of the social media tools above to share the story with others.